Bampton is a village and civil parish in the Eden District of Cumbria, England, on the edge of the Lake District National Park. It is in the historic county of Westmorland. The parish had a population of 283 according to the 2001 census, increasing to 373 at the 2011 census. The parish includes the villages of Bampton, Bampton Grange and Martindale. Bampton Grammar school was founded in 17th century when the industrial population was comparatively large. Depopulation reduced the necessity leading to the budgetary axe to fall on school provision. Until 2005 Bampton had a village school, which closed due to lack of children. Haweswater Beck arises as a stream discharge from Haweswater Reservoir and flows eastward, just north of Firth Woods, and then turns north to join the River Lowther between Bampton and Bampton Grange. The village of Bampton centres on Bampton Village Store Bed & Breakfast, post office, the village hall, playground, garage and caravan site. In Bampton Grange is St Patrick's Church, Bampton and the Crown and Mitre Inn. Also within the village is the traditional red telephone box used in the 1987 cult classic movie Withnail & I. There is a book called Ploughing in Latin that has been written about Bampton and one called Cast Iron Community about Burnbanks, the village built to house the Haweswater dam-builders. ^ "Parish population 2011". Retrieved 20 June 2015. 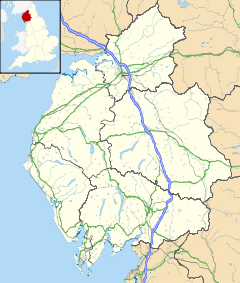 Wikimedia Commons has media related to Bampton, Cumbria. This page was last edited on 21 March 2019, at 14:00 (UTC).